Robert “Bob” Chancer has been a resident of Hawai‘i Island since 1977. When he moved to the Kohala Coast in 1981, he launched his Hawai‘i real estate and has been serving his clients with excellence and integrity for more than three decades since then. He played a significant role in the evolution of the area’s residential real estate market, involved in marketing and sales at many of the premier new resort developments that cropped up over the years. As a result, he is intimately familiar with the offerings at each of the many resort communities along the Kona-Kohala Coast. 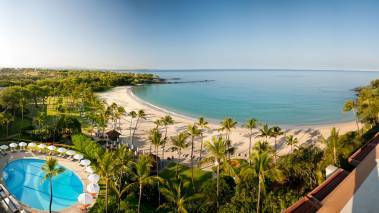 Bob served as the exclusive sales agent at Kauna‘oa at Mauna Kea Resort. He took the helm at Mauna Kea Realty – A Hawai‘i Life Company since 2013 when he took the helm with partner Steve Hurwitz. They were able to increase the firm’s market share and sales volume tenfold in just a few short years. To do so, they leveraged their broad network of clients and relationships along the Kona-Kohala Coast, established and nurtured over the course of more than 30 years. They also improved the marketing and client offerings by embracing digital and online strategies. Seeing an opportunity to expand their success further, they joined forces with Hawai‘i Life. Their Kona-Kohala Coast expertise and long-term perspective have been enhanced by the unrivaled statewide network, global affiliations, brand recognition, and digital platforms of Hawai‘i Life. The 10-year old firm is the statewide leader in luxury listings and sales and the third largest brokerage in Hawai‘i. Throughout his Hawai‘i real estate career, Bob has held many senior leadership sales roles. He served as the Principal Broker of Sea Cliff Realty, where he was the exclusive sales agent for 49 Black Sand Beach at the Mauna Lani Resort. Bob also served as the Principal Broker at Pauoa Beach Realty in the same capacity, working as the exclusive sales agent for Pauoa Beach at Mauna Lani Resort. His experience has taken him to Costa Rica, where he served as Vice President of Sales and Development for Peninsula Papagayo and the Four Seasons Resort. His son Jake Chancer has followed in his footsteps, working alongside his father as a Realtor at Mauna Kea Realty – A Hawai‘i Life Company.